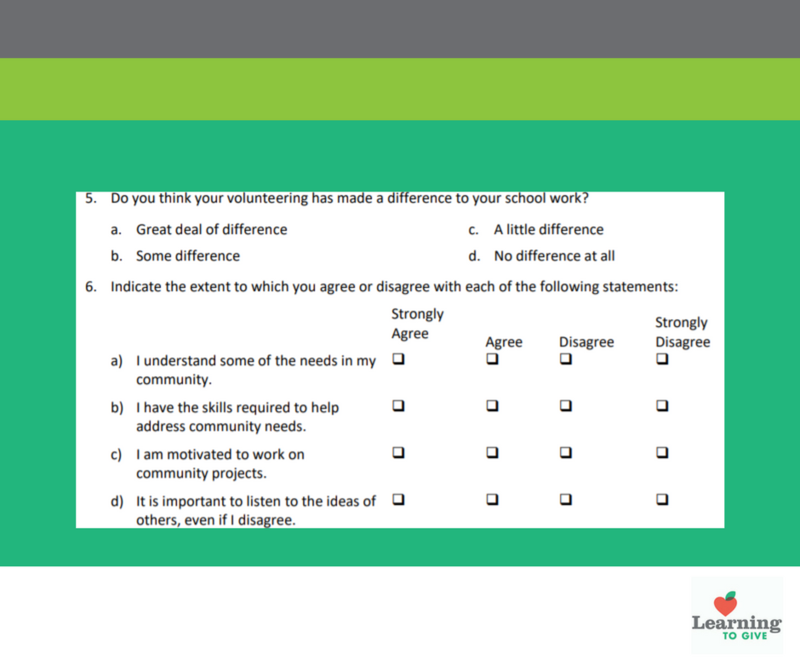 Assessments for students, teachers, families, and community partners to document the impact of service-learning and philanthropy instruction. The handouts below are evaluations that may be completed by parents and families, community partners, students, and teachers. These evaluations may be used in conjunction with any Learning to Give lesson, toolkit, or resource. The goal is to help you collect information about the impact of your philanthropy and service-learning instruction. The questions ask about actions, attitudes, and behavior changes. For students and teachers, we provide pre- and post-assessments. Complete these assessments at the beginning and ending of the year to document the impact of teaching students about their role in civil society and the impact of their voluntary action, or service. *You must have an active Learning to Give account to access the evaluation materials below. Learning to Give is interested in data related to school participation. We encourage you to send us copies of your evalutaions when you are done with them. The Learning to Give Philanthropy Field Guide is an exemplar to whole-school engagement. With your staff and community, form an evidence-based practice of what to teach, expect, and measure using The Philanthropy Field Guide Rubrics (Quick Harvest and Growing Roots). Keep your school on track with resource links, benchmarks, evaluations, and reflections. Plus, celebrate the journey with Learning to Give through social media!